Back when I had perfect eye sight, I think it was around the time the movie Pearl Harbor came out and saw those two P-40s come to the rescue, tracked down a few of them, but boy they be expensive then, and even more so now, like a Million bucks today. That is where RC entered, when my dad and I got the plug and play planes; spitfire and mustang, super weak foam wings, nothing like the Champ. The Champ out flies those two cheap planes. 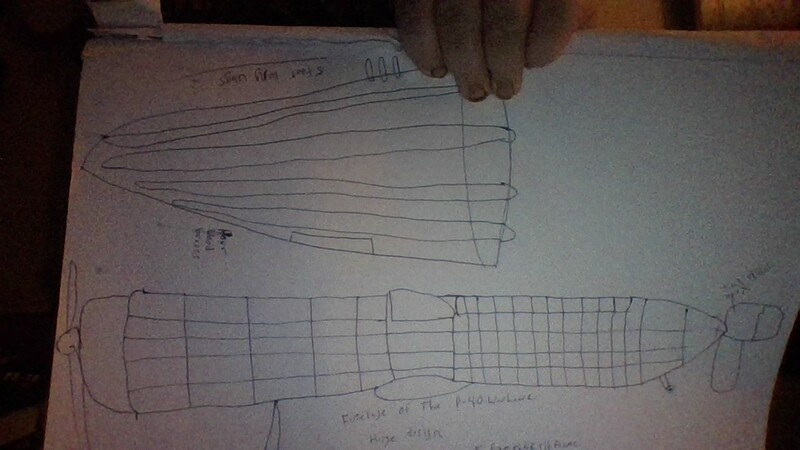 Anyway, watching Peter Sirpol's building of his actual plane, pretty neat, so was wondering if the same build techniques could be used to help my big builds, like the B-52 and whenever I get to designing and finally building the Mossie, then I guess build a nice size P-40 RC. If I continue with the massive builds, will need some where else to build once the holidays come around; might need the table at home. So yeah, thought to share some more love for flying. Absolutely. A friend of mine does a lot of airliner builds, he goes by the name KFC over on RCGroups. His build techniques would likely work well for you too. 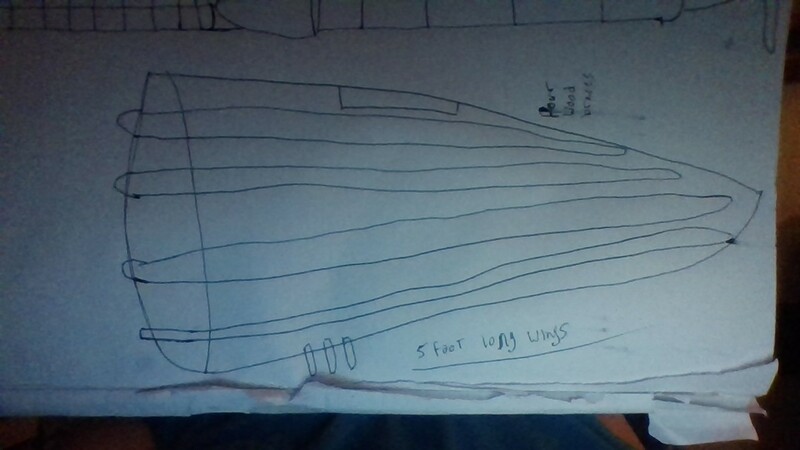 My best free hand sketch for a plane. 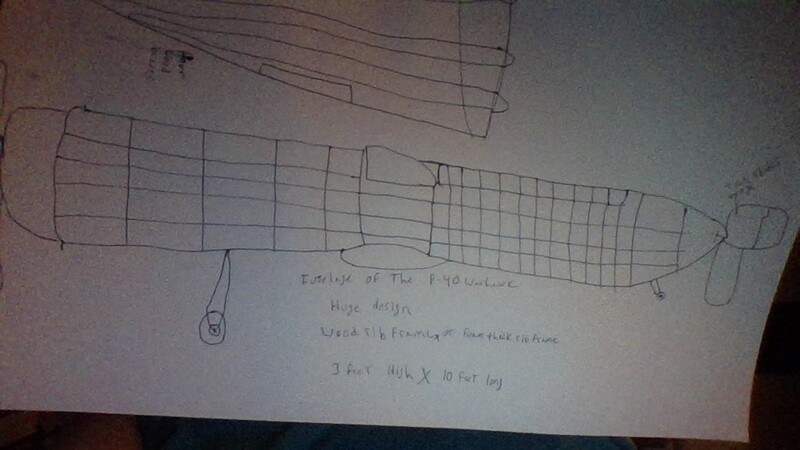 Okay the words under the fuselage read: " Fuselage of The P-40 Warhawk Huge Design. Wood Rib or Thick Foam Rib design. 3 feet high by 10 feet long. The next words side ways by the wings, 4 wood braces. Finally it says 5 foot wings. @Chuppster @DamoRC @Hai-Lee it's been a while since I've studied this plane, as I said, I wanted to get one when I was in high school and be a pilot, but as you know, they are super expensive. you will see the ailerons are different than other types, seems to be hinged onto the wing, not the wing moves. check it out. @FlyingMonkey idea on building the frame up top, any thoughts? I'd give input, but I'm having trouble visualizing what you are describing. Do you know of another design that's similar that we can look at to get an idea of what you're saying? 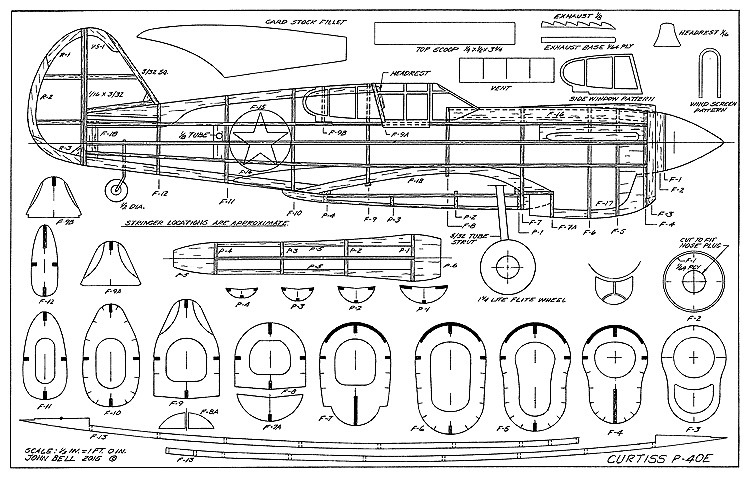 Are you saying you're thinking of building a cowl for each prop engine based on a traditional rib-and-stringer design? If so it should work just fine. I was thinking, you take how you shape the foam for the cowel, but do it the long way of the foam board, cut sections out to have the ribs when the frame comes together, the shape or roll shape used in making the cowel, the roll shape would give the rounded shape of the fuselage frame. sorry, it is hard for me to describe it to make it easy to understand, I can see it, but can't get it to explain out. hope this helps. Well, you can always try it! sorry for not being able to explain it, u ever have something pictured in your mind, but can't put it into words, that is what happened. Need to take that rounding build aspect, now make some cuts into the sides, so when you cut certain sections out, it will have the ribs there, then once the rounded portions of the walls take shape, the ribbed frame is ready.